MIX mayo, sour cream and salad dressing mix until well blended. Stir in green and red pepper; cover. SERVE with STELLA D'ORO Breadsticks, NABISCO Crackers, vegetable dippers or chips. To make crudites for dipping, cut raw vegetables, such as peppers, celery and carrots, into strips about 1/4-inch wide and 2 to 3 inches long. Cut broccoli into small florets, leaving 1-1/2 to 2 inches of the stem on each floret. Place in shallow pan, cover with ice water and store in refrigerator until ready to use. To prepare bell pepper shells for serving dip, cut off tops of peppers; remove and discard seeds. With small knife, trim away white, pithy part of ribs. Fill pepper shell with chilled dip just before serving. 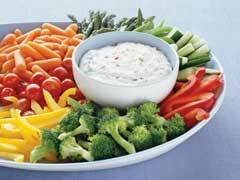 Surround with vegetable dippers.